First occupied on October 7, 1935, the Supreme Court building is a fitting home for the nation's third branch of government. Chief Justice William Howard Taft was behind the effort to provide the Court with its own building, moving out of the U.S. Capitol where it had been meeting since 1801. The Court did not move far, however. Its new location was just across the street and was selected to remain near Union Station and thus convenient for out-of-town lawyers. 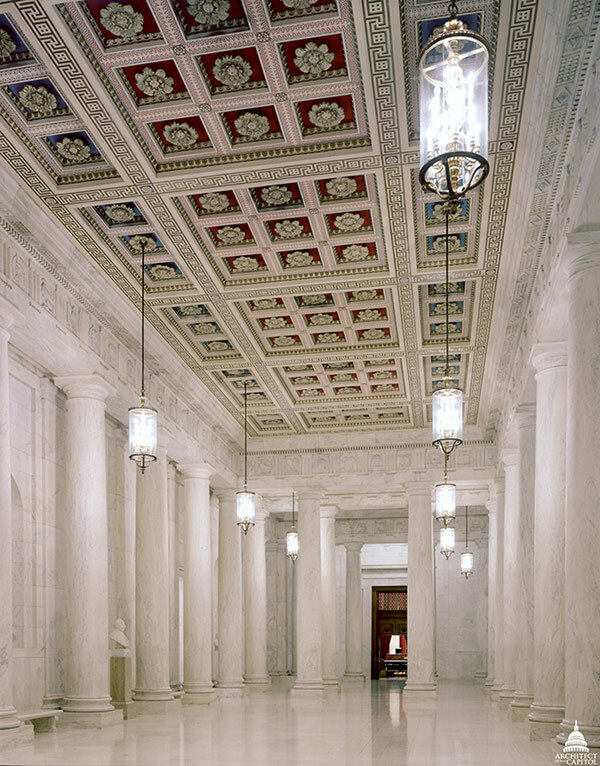 The architect of the Supreme Court, Cass Gilbert of New York City, drew upon the classical Roman temple form as the basis for the Court's new building. Reached by a great flight of broad steps, the portico of tall Corinthian columns gives the building a monumental entrance. Lower wings flank the central temple, and help relate it to the lower-scaled buildings of the nearby Capitol Hill neighborhood. 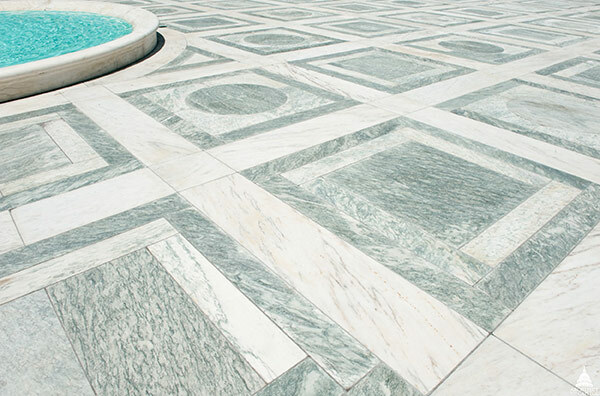 Details on the west terrace of the U.S. Supreme Court Building. 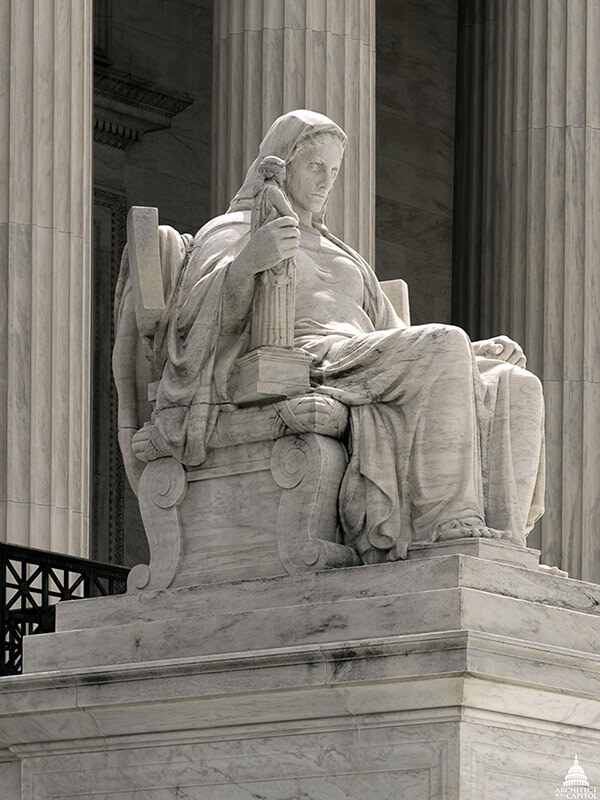 The design of the Supreme Court building achieved a balance between classical grandeur and quiet dignity, appropriate for the nation's highest court. 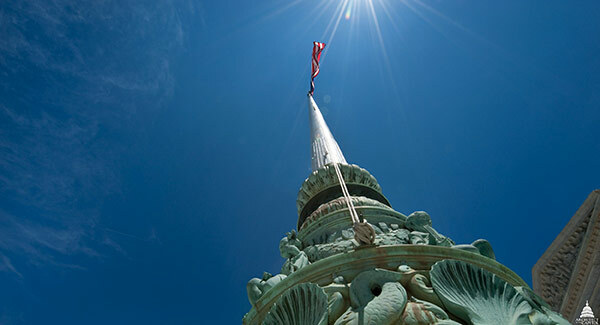 Unlike the Library of Congress' Thomas Jefferson Building next door (a textbook example of the flamboyant Beaux Arts style), the Supreme Court was designed in a quieter, more reserved style now termed neoclassical revival. The building is a steel frame structure faced with white marble. The facade was about 300 feet wide with a central temple-like pavilion fronted by a monumental portico of 16 Corinthian columns supporting an elaborate entablature. The commanding central section was flanked by lower wings in the Ionic order. Four spacious courts provided the interior with unexpected sources of light and air. The plan carefully and deliberately separated the justices' working areas from the public, ensuring privacy and quiet. Statue of Contemplation of Justice by James Earle Fraser on the main steps, and the Great Hall with double rows of monolithic marble columns that rise to a coffered ceiling. Although the court room could have been larger, Taft wanted to preserve much of the intimacy that he liked in the court room in the U.S. Capitol Building. Above the court is the law library, an elegant room paneled in oak with carvings of appropriate emblems and allegorical figures. 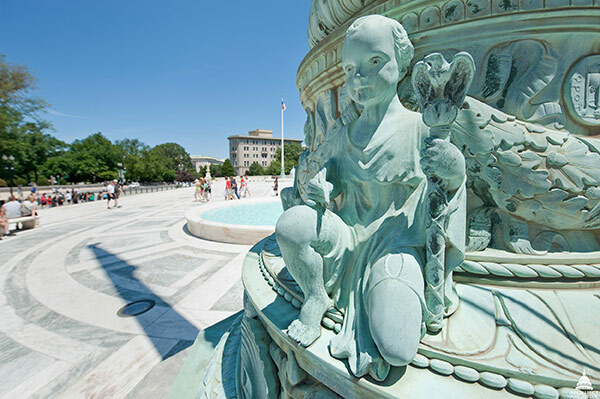 The Architect of the Capitol's (AOC) Supreme Court Jurisdiction is responsible for building and grounds maintenance, historic preservation, structural and mechanical care, alterations, design, and construction of new facilities. All duties and work required for the care and custody of the Supreme Court are performed under the direction of the Marshal of the Supreme Court and the AOC Facility's Manager's Office, respectively. The operational needs consist of facility management services, such as the day-to-day structural and mechanical care and building and grounds maintenance. In December 1928, Congress responded to Taft's initiative by creating the United States Supreme Court Building Commission. Taft was designated chairman and was joined by Associate Justice Willis Van Devanter and the chairmen and ranking members of the Committees on Public Buildings of the House and Senate, and the Architect of the Capitol. In April 1929, Gilbert was formally hired by the commission to design the Supreme Court building. 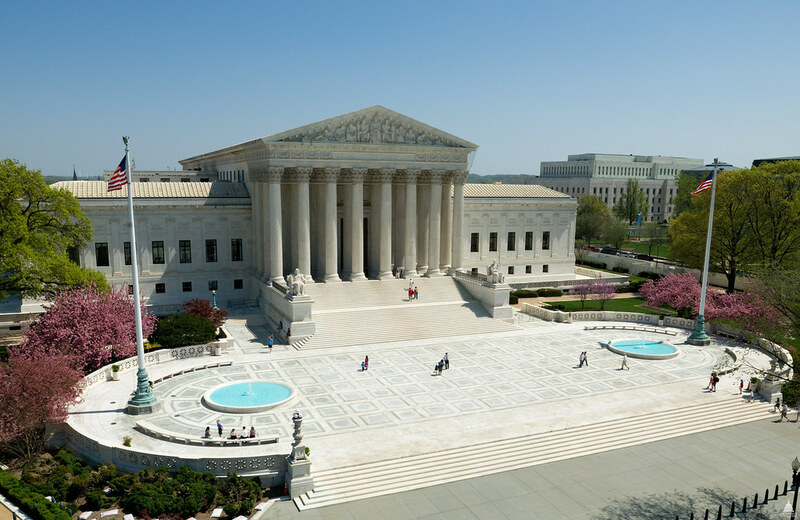 The United States Supreme Court Building Commission favored a site for the new Court building on First Street east, directly across from the Capitol between Maryland Avenue and East Capitol Street. Cass Gilbert did not like the site across from the Capitol because of it subordinate position and because Maryland Avenue, one of L'Enfant's diagonal streets, made it irregular. Nor did he like the idea of building next to the baronial Library of Congress. But Chief Justice Taft and other members of the building commission liked the location on First Street, particularly due to its close proximity to Union Station. The design was approved and, on May 25, 1929, the Speaker was informed that the new Supreme Court building would cost $9,740,000. The funds were appropriated on December 20, and demolition of the residential structures on the site began soon thereafter. On February 3, 1930, with the funding secure and the project well under way, the ailing chief justice retired from the Court and from the commission. A month later Taft was dead. 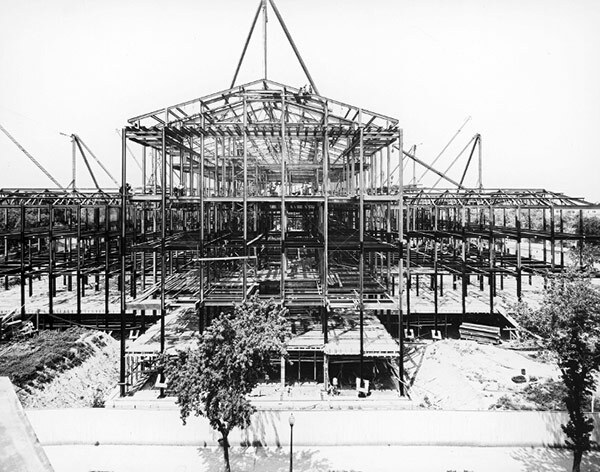 Steel framework of the Supreme Court Building being installed in July 1932. President Herbert Hoover laid the building's cornerstone on October 13, 1932. Work progressed during the depths of the Great Depression and was nearing time to consider the furniture when Gilbert himself died. Finishing the great work was left to Gilbert's son, Cass, Jr., and his associate, John R. Rockart. Despite some labor strikes, the building was completed on April 4, 1935, at a final cost of $9,395,566.